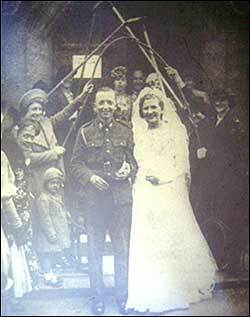 A new line in bridal arches at Wednesday's wedding of Miss Joy Pettit, believed to be Rushden's first woman fire fighter. The bride is an enthusiastic member of Moor-road East street fire squad, and her colleagues gave her a gay end-off as she left St. Peter's Church. Moor-road residents formed a guard of honour, “armed” with fire-fighting implements, outside St. Peter’s, Rushden, on Wednesday afternoon after the wedding of Miss Joyce Marian Pettit, the first lady member of their street A.R.P. squad (Moor-road East). The bride is the youngest daughter of Mr. and Mrs. Alfred Pettit, of 25 Moor-road, Rushden, and her bridegroom was Mr. Kenneth George Edwards, eldest son of Mr. and Mrs. H. G. Edwards, 73 Croyland-road, Wellingborough. Given away by her father, the bride was attired in figured satin and carried an ivory Prayer Book. She was attended by her niece, Miss Audrey Sylvia Wood (in spotted organdie) and the bridegroom’s cousin, Miss Margaret Harris (in figured taffeta), both bridesmaids carrying bronze chrysanthemums. The service was conducted by the Rev. W. L. Warrington. Mr. E. Pettit, brother of the bride, was best man, and Mr. W. P. Jolley was at the organ. A reception was held at 25 Moor-road, where Mr. and Mrs. Edwards will reside. Numerous wedding gifts were received.